If you didn’t see The Anti-Social Network, Richard Bacon’s timely BBC3 investigation into internet “trolls”, cyber-bullying and the desecration of RIP tribute sites, you’ve a couple more days before it disappears from the iPlayer. I hope the BBC repeat it; it really is required viewing if you regularly spend time on the internet, especially if you use Twitter or Facebook. The fact is, there’s some nasty stuff going on at the more anonymous end of the worldwide web. We all know about trolls. In the past, on this blog, and on Twitter, and more recently when I’ve put my head above the parapet on the notoriously brutish Guardian website, I’ve been lightly trolled. My first response is always to reason with them, but this pretty much always backfires, because a) they are aiming to elicit an emotional response and in doing so you “feed” them and encourage them, and b) they don’t respond well to reason, or calm, or any of the other tools I often use on detractors or the just plain rude. Thanks for the advice. Now, to be fair, this is not typical behaviour for a troll, so let’s go mad and say that this man isn’t one. However, when somebody puts their hand up and tells you that your work is “excrement” they are using the tactics of a troll. It all comes down to manners in the end. Which is why I am about to republish my Manners Manifesto from January 2008, except updated to include manners on the internet, which is a growth area for rudeness. The non-troll above is right in the sense that, yes, I do work in a “creative field”, and I can be thin-skinned sometimes, but I don’t accept that in this field, I must “accept” having my work called “excrement” by a man hiding behind a pseudonym, totally untraceable, when my “creative” work is done in public, in forums where I am totally identifiable and traceable. I have been moderating comments on this blog for years now, and the abuse has pretty much dried up, which rather proves that without a platform, trolls soon lose interest. My guess – and I may be wrong – is that if the man above met me in the street, or in a social situation, he would not tell me that he thought Grass and Not Going Out were “excrement.” He would either not mention it, or he would say that he didn’t really like them, if pushed for a preference. He wouldn’t, because if he did, it would be rude. Here is the news: it is just as rude on a website. Anyway, I bet he hasn’t seen every episode of Not Going Out. Episode Two of Series 3, which I co-wrote, was BRILLIANT. The Manners Manifesto 2012 will follow over the next couple of days – I want to post it separately so that it can be accessed in its pure form. In the meantime, be nice to each other, as Derek Batey used to say on Mr & Mrs.
Time to review a book. Yes, a book. The Shallows by Nicholas Carr has really had its hooks in me for the past couple of weeks. (If it wasn’t in hardback, I’d have taken it out with me on the train and finished it sooner.) I was told it would scare me. It sort of did, although it tells universal truths which everyone who uses a computer, and especially the internet, already knows but would probably just rather not think about. Carr is an American business and technology writer, and former editor of the Harvard Business Review. He’s clever. He’s readable. What he’s not is a Luddite. You should know that. 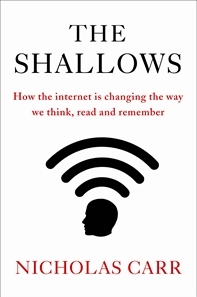 The Shallows seems to have grown out of an essay he wrote for Atlantic magazine called Is Google Making Us Stupid? Let’s proceed from that starting point. Carr is roughly the same generation as me – a bit older, born in Cincinnati in 1959, but pretty excited when Star Wars came out and an early Apple adopter; at the beginning of the book, to set out his stall, he describes the way his own life has been gradually changed through an enthusiasm for computers and what used to be called the World Wide Web. He’s as wired today as you probably are. You’re reading this on a blog, probably on a laptop, or a home PC, or an iPad. Why not print it out, if you’re hooked up to a printer, and read it on A4? After hearing the alarm bells set off by The Shallows, you may be tempted to do this more often, even though you won’t. Who’s got the time? Carr brilliantly described the internet, which we all understand, in ways we hadn’t thought of: as a “cacophony of stimuli,” as an “ecology of interruption technologies” … he even mines TS Eliot’s Four Quartets for the phrase “distracted by distraction from distraction.” You know he’s right. You’re probably distracted from reading this already. In case we think any of this is new, Carr provides useful potted histories of the advent of the clock (monks, it turns out, divided the day up into units of time and built the first mechanical timekeepers, so that they could follow their regimented regimes of prayer) and of printed books, which caused a moral panic far greater than the one caused by Google; a man called Robert Burton wrote a book in 1628 called An Anatomy Of Melancholy, in which he described, with alarm, “the vast chaos and confusion of books”. This was a century after the Gutenberg press made the printed book a reality. “We are oppressed with them,” he wrote. “Our eyes ache with reading, our fingers with turning.” Books, you see, were destroying the centuries-old oral tradition. As a device for reading, the book retains some compelling advantages over the computer: you can take a book to the beach without worrying about getting sand in its works; you can take it to bed without being nervous about it falling to the floor should you nod off; you can spill coffee on it; you can sit on it; you can put it down on a table, open to the page you’re reading, and when you pick it up a few days later, it will still be exactly as you left it. You never have to be concerned about plugging a book into an outlet or having its battery die. It’s a scary book, because I know for a fact that my neural pathways have been, and are being, altered by constant attention to the internet. Most of my working day involves sitting at this MacBook, with wi-fi on, writing; and that requires research, which is all done with clicking, even though some days I am working in a library full of books. Anyone else see an irony in that? Google is a lot quicker and more efficient than the British Library, at least in an instant where I want to look up the exact date of the Gutenberg press on Wikipedia, which I just did. While writing The Shallows, Carr moved to the wilds of Colorado where he had no cellphone signal and only “a poky DSL connection”; he packed in Twitter and Facebook, cancelled RSS feeds and set hs email programme to check for new emails every hour, not every minute. He sort of hated it, but it helped him get his book written more quickly. He’s back on the drip now, incidentally, because, as I said, he’s not a Luddite, he’s as wired up to the electronic teat as you and me. But his book makes you think. And it requires “deep reading”, as he puts it – that skill which is being eroded. The very fact that I read it in book form makes me feel smug. You might, too. I’m lucky, I was raised and educated in a world of books and comics and magazines; I even began my writing career in a world of newspaper cuttings services and typed on a typewriter – I at least appreciate both worlds and what they have to offer, and can toggle between the two; what chance does the generation whose schooling involved doing homework with Google have? None.